Get Crash Course in Family History, 3rd edition ($34.95 value, 240 full-color pages) FREE when you purchase the Legacy Deluxe Bundle. Crash Course in Family History is the number one, best-selling "how-to" family history book in bookstores. Author Paul Larsen recently announced an expanded 4th edition which we will soon have available for purchase. So after all of our brainstorming on what we should do with the dozens of 3rd edition books we recently ordered, we concluded that we would give them away for free with any new purchase of our Legacy Deluxe Bundle. 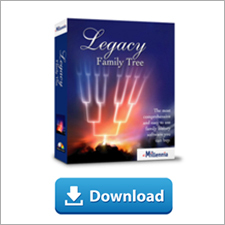 If you've been considering upgrading or even purchasing Legacy for a friend or family member, now is the perfect time. Legacy 7 Deluxe software on CD and via download. Legacy Charting Deluxe software (installed when Legacy 7 is installed). Official 336-page printed user's guide. Legacy for Beginners training video (on installation CD) (44 minutes). Mastering Legacy: Names, Dates & Places training video (44 minutes). Your 12-Step Checklist to Using Legacy training video (48 minutes). Legacy's Ultimate Guide to Sources training video 40 minutes). Researching with Legacy: Mastering Events & Chronologies training video (45 minutes). This bundle sells for $59.95 (items sell separately for $72.90). Together with the Crash Course book, you're getting over $100 of products for just $59.95 (plus shipping). For more information on Crash Course in Family History, including the Table of Contents, click here. For more information on the Legacy Deluxe Bundle, or to purchase, click here. No coupons necessary. When you add the Legacy Deluxe Bundle to your cart, the Crash Course book will automatically be added at no extra charge (again, while supplies last). We've all experienced it. Beginning and seasoned genealogists do it as a reaction. It happens day or night. Other people hear it but don't understand it. It is often followed by the genealogy happy dance. The Genealogy Scream comes in different forms. Sometimes it's a silent "YES!". Other times it's an audible "Hallelujah!". For some, it's a fist-pumping "hoo-hoo-hoo". When it happens in a library, other genealogists don't mind hearing it, because they've been there too. I guess some Genealogy Screams are not filled with excitement.... "Where are you in the 1830 census!!!???" or "I thought you were born in Germany. That's what the Internet said!!!" Wherever or however you experience your Genealogy Scream, it's something that all genealogists have in common. Our friends may not understand it, our families may be annoyed with it, and even our neighbors may tire of it, but genealogists share a bond. When nobody else cares, we know we can find another genealogist that does. I always look forward to genealogy seminars because I can finally talk with others who are actually interested in what I have to say. Think back to either your first or your most recent Genealogy Scream. What was it like? Was it followed by the Happy Dance? Was anyone else around? If you did not have anyone else to share it with, we'll listen. Write your comments below. 26 Million New Names Added for Costa Rica, France, Hungary, Mexico, Spain, and the U.S.
Twenty-nine new collections were updated or added this week at FamilySearch.org—with 26 million names and 1.5 million digital images! The international collections continue to expand with exciting new additions for Costa Rica, France, Hungary, Mexico, and Spain. In addition, nine more indexes were added to the U.S. 1910 Federal Census collection—that means it is 37 percent complete! This project is moving along quickly. There are now 428 collections from original source records available online at FamilySearch. Search all of these great collections for free online at FamilySearch’s Record Search pilot (from FamilySearch.org, click Search Records, and then click Record Search pilot). None of this would be possible without the great contributions of many online FamilySearch volunteers. These individuals donate the time and effort needed to make these collections freely available to FamilySearch patrons. If you would like to help by donating a few minutes online with projects of personal interest, become a FamilySearch community volunteer at FamilySearchIndexing.org. Many hands produce great work. Thank you for your support! While browing the Genea-blogs this morning, one of DearMYRTLE's stories made me laugh. A man hurried in through the center doors, explaining his wife was waiting out in the car. He said "I heard that the Mormons were doing family history. I came to pick mine up!" ...if only it were that easy. Sure wouldn't be fun though. Although, I'd love to run into a Family History Center and learn that someone had just found Nathan Brown's parents. Legacy Family Tree User Groups are beginning to dot the globe. A new group is forming in Capiata, Paraguay. The meetings will be held the first Saturday of each month at 16:00 in Capiata. Contact Michael Slater for more information. For a list of Legacy User Groups around the world, click here. Also, see our busy Legacy Calendar 2010 for Legacy-related events. Looks like we have 23 more conferences/seminars this year. Last weekend's conference in Burbank, California was our company's most successful conference ever. Next year's calendar is also quickly filling up. If your genealogy society would like us to participate in their annual seminar, let us know. Here's a little extra incentive to stop by the Legacy Family Tree booth at the Southern California Genealogical Society's Jamboree 2010 this weekend(begins Friday, June 11, 2010 in Burbank, California). We're giving away two free Acer Netbook computers. The drawing is open to registered attendees and the entry form (a simple, fun crossword puzzle) will be included with your registration materials. Just fill out the puzzle and turn it in to the Legacy booth. The first drawing will be held during my/Geoff Rasmussen's 6:15pm class on Saturday entitled "Brick Walls Be Gone: Using Legacy's Research Guidance and To Do List tools". This class will be held in the Pavilion ("the tent") directly behind the Convention Center, adjacent to the lawn. So be sure to turn in your entry form before 6:00pm on Saturday to be eligible for this first drawing. The second drawing will be held at the very end of the conference on Sunday with the grand prize drawings. If your entry form was not selected for the first drawing, it will still be available to be drawn for this second drawing. Be sure to turn in your entry form before the last class on Sunday. All the contest rules (like you must be present to win, etc.) are explained on the entry form. Click here to download the form, or you can obtain yours in the registration packet at the conference starting Thursday evening (for pre-registrants). If you cannot make it to the conference, download the form anyways - it's a fun crossword puzzle! Legacy's founder, Dave Berdan, and Geoff Rasmussen (that's me) will be at the conference - so bring your questions and suggestions - we look forward to talking with you. Friday, 3:00-4:00pm - Organizing, Planning, and Sharing Using Legacy Family Tree. 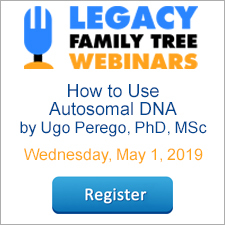 See how Legacy helps you write sources correctly and easily, Evidence Explained style, and learn how to create shareable CDs, migration maps, customized wall charts, publish books, get automated research suggestions, and much more. Saturday, 10:00-11:00am - Genealogist's Guide to Working with Digital Images. Learn how to easily digitize, organize, and share your digital pictures. You’ll learn how to easily locate any picture in just seconds. Saturday, 11:30am-12:30pm - Insider's Guide to Legacy Family Tree: Tips & Tricks. Get a more in-depth look into Legacy: tagging, custom reports, little known tips, and much more. Sunday, 8:30-9:30am - Timelines and Chronologies: Secrets of Genealogical Success. Learn how to easily create an effective timeline using software. Learn the six elements of a good timeline and how timelines solve difficult research problems. We have a great new update for you, although most of the improvements and fixes are pretty minor. As you can see in the release notes (in the what's been fixed section below), we've done a lot of work and fine-tuning with the relationship calculator (Tools > Set Relationships or Tools > Relationship Calculator). It didn't find any new relationships between my wife and I (we're still 13th cousins, and 13th cousins once removed) but with the new option, we're now able to use the term "great-aunt" instead of "grand-aunt" if desired. Relationship Report - Added option to include lifespan years after the names. Search and replace - When performing a Search and Replace you can now enter a TAB character or a CRLF by using these special representations «tab» and «crlf». Relationships (Tools > Set Relationships) - added an option to use "Great" or "Grand" for uncles/aunts, nephews/nieces at 2+ generations. Relationship Report - new format for step-relationships. View the May 30, 2010 release notes here. New records now online for Brazil, Canada, Czech Republic, Guatemala, Mexico, Spain, and U.S.
Click here to search these records. Researching your Irish ancestors just got a lot easier. Thanks to The National Archives of Ireland and their partners, all 32 counties of Ireland census records for 1901 are now available and searchable online, giving access to more than 4.5 million records. According to this article at irishtimes.com, "the latest records to go online are expected to rival the popularity of the 1911 Census records, which went up on the web between 2007 and 2009 and have since attracted more than 260 million hits..."
We've now added the online links to this and the 1911 census to Legacy's Research Guidance. When this update is released, just navigate to one of your relatives who would have been alive in 1901, and click on the Research Guidance tab (upper right of Legacy). When you then click on the Suggested Sources button, you will get a prioritized list of suggestions to help you research this person. One of the suggestions will be this new 1901 census. Simply click on the Online button if you want to do the research right now, or click on the Plan to Search button to add the task to your To Do List. So...great news for Ireland! Now if someone could find a complete index to all the births, marriages, and deaths of everyone in Ireland for the 1700s, I'd be really happy. ProGenealogists, Inc., announced today that it has again identified the 50 most popular genealogy websites, updating an important and useful tool for the world’s family history searchers. Kory Meyerink, Vice-President at ProGenealogists, explained that today’s online genealogists face thousands of websites and millions of web pages that might contain information about their ancestors. “They can’t search them all, so for the past three years, we have been tracking the most visited sites. Simply put, if thousands of other family researchers found a site to be useful, all researchers should know about such sites and check them out,” said Meyerink. The study was designed in a manner similar to the popular “places rated” lists that appear regularly in the media. By ranking the websites on different criteria, and then averaging those rankings, a consensus list of the most popular sites emerges. In addition to popular and well-known Alexa.com, the other companies, whose rankings are all based on different web traffic criteria, used in this study were Compete.com, Quantcast.com and Ranking.com. Other interesting changes include growing popularity for relative newcomers, the subscription site GenealogyBank.com (19) and the free data site, Genealogytrails.com (25), each of which has jumped at least 10 spots in each of the past two years. Another free search site, GenealogyBuff.com moved up over 100 places into the 27 slot from 134 last year. “It goes to show that the genealogy space on the web remains fluid and that people continue to look for data about their families,” said Natalie Cottrill, President and CEO of ProGenealogists. “The presence of six data-rich sites among the first eight is expected. The changing popularity of social networking sites is interesting, too, because it reflects current Internet trends. While FamilyLink.com jumped up 78 positions, MyHeritage.com remained steady in the number three slot. Meanwhile, two other similar sites, Geni.com and MyFamily.com dropped from the top ten into the 30s.” The largest data site, Ancestry.com, is a subscription based site and remains number one. With nine subscription sites in the top 50, it’s clear that people are willing to invest in their heritage. Several special focus sites are also popular, including several devoted to cemetery and census information. To see the complete list of 2010’s 50 most popular genealogy sites, go to http://www.progenealogists.com/top50genealogy2010.htm.